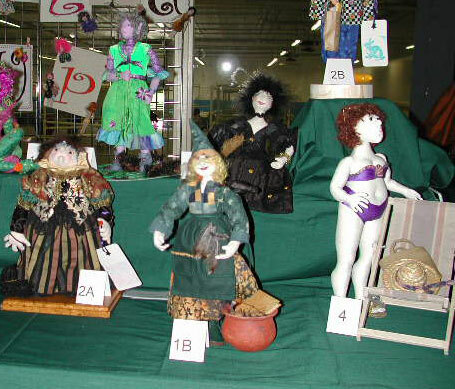 Identification of dolls is from left to right unless otherwise indicated. More complete descriptions follow after the pictures. Click on the doll maker's name to go directly to the description of that doll. If there is no link, there is no further description . MMarbles was created from mixed pattern pieces from Patti Culea’s Creative Doll Making book for the body and for the head I modified a pattern piece from Lucy Garvin. El-Sea Made from Jacquie Lecuyer’s Uma pattern. Pedestal Doll The doll is an adaptation of a pedestal doll popularized by American doll artist Lynne Sward. Jacquie in the Pulpit This is my version of Jacquie Lecuyer’s Uma. A Walk with Sir Douglass Made from a Magic Threads pattern “Secret Keepers” by Julie McCullough. Abigail created from Lucy Garvin’s Fenwick pattern. Good time in the Making Made from a Country Friends pattern “Cousin Nell ” designed by Wendy Brigg. Super Zoey This is Evelyn’s interpretation of Julie McCullough’s Magic Threads pattern Super Zoey. Mother Nature Mother Nature was designed by Julie McCullough. Mrs. Darragh Made from Jacquie Lecuyer’s Uma pattern. Winter Get Away The doll was made from Jane Coughlan’s “Beach Babe” pattern. Ovarna This doll was made from Jacquie Lecuyer’s Ovarna pattern. Auntie Mame Auntie Mame was designed by Peggy Wilson and made by various members of the doll club and given to Jacquie. Tree Spirit The pattern for the basic stump doll was designed by Jacquie Lecuyer. This is my version of Jacquie Lecuyer’s Uma. Her vest is both wired and quilted. She was challenging and fun to make. Abigail is a young friendly witch just learning her trade. She is a “brown bag” doll created by Bonnie Pritchard from Lucy Garvin’s Fenwick pattern. 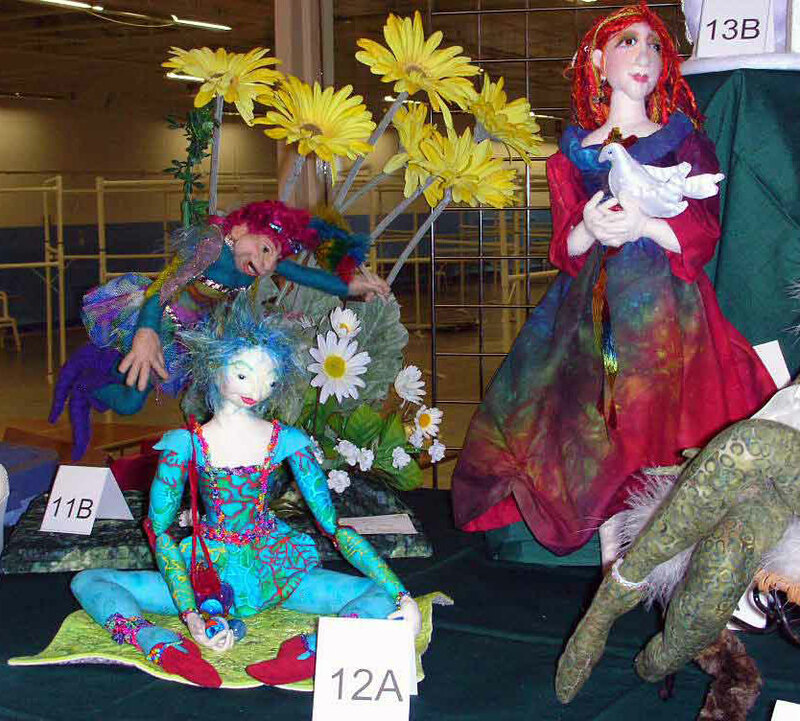 All clothing and accessories were designed and provided by Peggy Wilson, Barbara Hamilton and Nancy Leigh-Smith. Made from a Magic Threads pattern “Secret Keepers” by Julie McCullough. Made from a Country Friends pattern “Cousin Nell ” designed by Wendy Brigg. Made from Jacquie Lecuyer’s Uma pattern. An original doll created for the All Dolled Up Winter Challenge. This is Evelyn’s interpretation of Julie McCullough’s Magic Threads pattern Super Zoey. Maxine made the original doll with hair and painted face. It was then passed once each month to a member of the brown bag group of Jacquie Lecuyer, Peggy Fadyk, Peggy Wilson and Jo-Ann Raven. 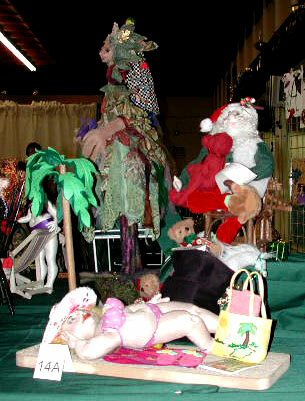 As the Santa travelled from doll maker to doll maker he was dressed from the waist down, from the waist up, accessories were added and finally the doll was posed. 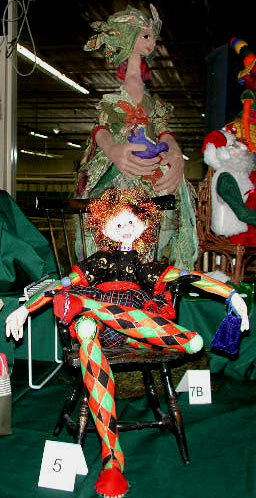 This doll was designed at a workshop given by Peggy Wilson. It was the first doll designing course that has been offered to the club and I jumped at it as I felt I was ready to go to this next stage of doll making. It was a two day course full of ideas and techniques and lots of inspiration. I had brought along a magazine that had a painting of several women on the cover thinking that these characters would make a great doll. And so happily, with a weekend of work and a lot of luck, here she is my sweet little Savanna. Mother Nature was designed by Julie McCullough. 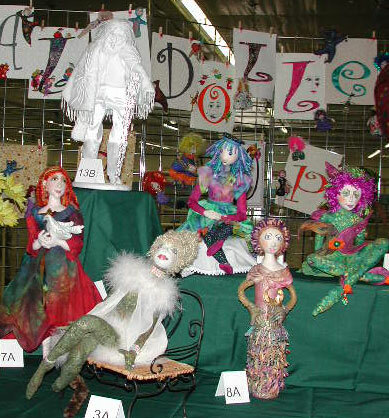 The doll is an adaptation of a pedestal doll popularized by American doll artist Lynne Sward. 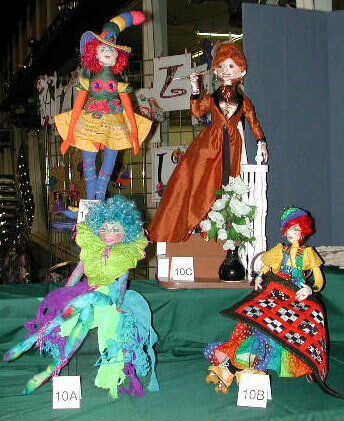 The doll was made from a pattern designed by Patti Medaris Culea in her book Cloth Doll Making (2003). The doll was made as part of a brown bag exercise with a with theme. 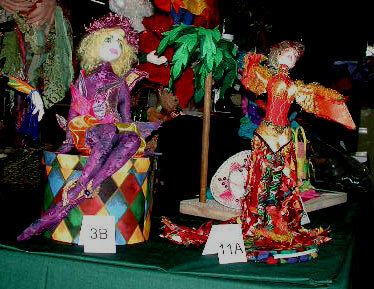 The other participants were Barbara Ross and Jacquie Lecuyer. Started as a skater and ended up an elf this doll was created during a “ brown bag” exchange. This doll was created for a Mystery Doll Challenge for Ottawa’s cloth doll club, All Dolled Up. We received the pattern for a basic stump doll designed by Jacquie Lecuyer, one body part each month, hence the mystery. It was to be made from found or recycled items. I redesigned the pattern to suit my own twisted imagination. Her trunk was made from an old cushion from the 60's. The child is a piece off an old apple tree. The rock was found on a nature walk with my son over 20 years ago and the mouse hiding in the piece of wood was found on the floor at my work. The Leaves were embroidered over sewing scraps from a friend and the flowers are a scrap of yarn from another friends project. The hair was sent to me from Italy from a former student who’s boyfriend worked in the fashion district. It is scraps of mohair that he picked off the cutting room floor. The nest is an acorn cap from the park next door and the eggs are small navy beans. .
An original design by Jacquie this doll has burnt clothing and a wired vest. This is the newest design by Jacquie for all her quilting friends. The 9-patch quilt was done for the challenge in 2003-3004 and completed as a U.F.O. this year. Auntie Mame was designed by Peggy Wilson and made by Lisa Corr (organizer), Edwina Sutherland, Val Rochester, Diane Dent, Linda Potter, Peggy Wilson, Cal & Tammy Alexander, Jo-Ann Raven, Julie Brais, and Julie McCullough. It was given to Jacquie. An original cloth doll with machine embroidered fabric. 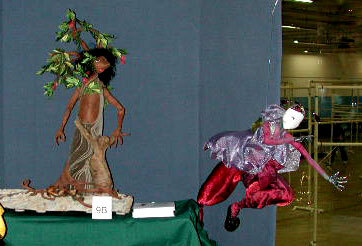 An original design, the doll is needle felted with machine embroidered wings. A Marbles…see I’m not losing them I’m finding them! Marbles was created from mixed pattern pieces from Patti Culea’s Creative Doll Making book for the body and for the head I modified a pattern piece from Lucy Garvin. She is a doll created for our Secret Sister exchange where we each provided the materials every month with which another doll member would create a doll to trade at the end. Allison Marano’s Bookshelf Pixie pattern. She started out demure, but her face and mouth grew into this expression full of attitude and the first body I made her no longer suited her…she wanted bright, rich, luscious reds and greens and not the soft pastel greens and mauve I had started out with. Maeve loves to dance in the flower garden and doesn’t mean to be destructive. She’s just an enthusiastic garden spirit. She was created for the Secret Sister exchange. Ol’ Man winter in just about to blow his last storm of the winter. Lizzie was inspired by the material for the 2004 Inspirations Needlecraft Show challenge. The doll was made from Jane Coughlan’s “Beach Babe” pattern. My Beach Babe is basking in the sun on a beautiful beach in Mexico under sunny skies and palm trees. She is taking it easy enjoying her favorite dolly magazine and sipping on a strawberry margarita. She has enjoyed shopping from the beach vendors purchasing jewellery, a sombrero, and a beach mat. The palm tree was made from felt and doweling, the sun tan lotions and fancy drink from Fimo and the sandals from foam sheets. This doll was made from Jacquie Lecuyer’s Ovarna pattern.